What is queer culture? Is it Pride parades with the flotilla of Dykes on Bikes, drag queens, leather daddies and dance music? Is queer culture the collective body of bars, organizations, events and arts in large metropolitan centers? Queer is most often hitched to an urban environment, but reading Jeff Mann’s Loving Mountains, Loving Men calls that assumption into question. Mann’s own life is a contrast to the queer he jokes about although their backgrounds are most likely similar. Raised in rural, religious Appalachia, Mann comes to terms with a sexuality that leaves him at odds with nearly everything about him. While the man in Ballard remains closeted, Mann makes a difficult journey toward openness and honesty. Loving Mountains, Loving Men is not only a coming out tale—and with queer literature neck deep in coming out stories, this comes as a relief. The book is a love song to his Appalachian roots, the culture and landscape that continues to shape him. Mann’s prose illuminates the landscape and enlivens it for readers. He also continues the Appalachian tradition of storytelling by handing down the history of his family. And there is the food, much loved recipes prepared meal after meal, generations of cooking handed down as sure as blue eyes or black hair. What resonated deeply for me in Loving Mountains, Loving Men was that it addressed a mostly unspoken difficulty for rural queers. Mann voices why many lesbians and gay men choose to stay put. “Sometimes it feels as if my Appalachian roots and my desire for men are two lovers I vacillate between. When I feel spurned by one, I take up with the other.” The central tension for Mann and many nonurban queers is how to reconcile both of these loves. Another aspect that sets this memoir apart from others is its use of poetry. Mann intersperses the five major movements of this book with a poem and the final section is comprised entirely of verse. They tell Mann’s story in a language that prose cannot easily reach. The poems impart another view of the narrator, one that is not as evident in the prose. 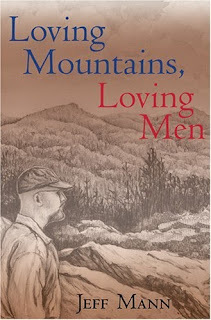 I would encourage readers to pick up a copy of Loving Mountains, Loving Men regardless of where they live. It will cause them to examine their own landscapes more closely and possibly hunt down a treasured family recipe. Rural queers will find themselves nodding their heads at Mann’s observations while urban ones will begin to understand what can’t be found in the city.